Everyone definitely wants to get rich quickly. The problem is just “how”? How can we get rich instantly? The answer is to win the Powerball lottery. Do you have a dream about winning one of the giant jackpot prizes from the Powerball Lottery? 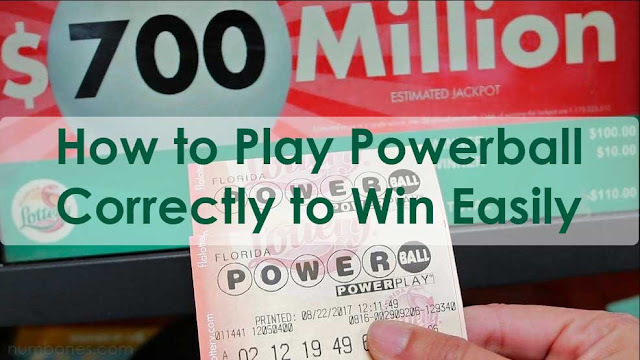 If so, you might need some of these well-chosen tips to help you understand how the Powerball Lottery works, the Powerball playing strategy and most importantly, how to win Powerball. Even though the reality is that all players cannot become powerball winner, and the chance are small to every person to be lucky enough to win this lottery and become an instant multi millionaire. But the reality is that if you don't play at all, then your chances of winning are only 0%! But if you use the tips that numbones.com shares, the chances of your victory will increase. First, we have to know well how to play powerball correctly. We have to learn the powerball rules, the powerball drawing time, and check powerball numbers. If we mastered all of these thing, we can beat this powerball easily, and become one of the most lucky person as powerball winners. Pick 5 numbers from 1 to 69, and 1 Powerball number from 1 to 26 in the Powerball play slip. Or if you want to choose a random number, just ask "Quick Pick.®"
Power Play® is a way to double your prize with 2, 3, 4, 5 or even 10 with an additional $ 1 per game! And if you want to add the Power Play option, mark the appropriate box shown on the play slip. To win this game, you have to match your numbers with numbers that drawn in 1 of 9 different ways. So the point is that to get your name in the hat to win playing the Powerball Lottery, the first step is to buy Powerball tickets. If you want to increase your chances of winning, buy more than one ticket. Because the more Powerball tickets you have, the greater your chance to have a winning combination numbers. This is the most basic Powerball strategy. If you don't have all five winning numbers and one Powerball number to get the lottery jackpot the main prize, you don't need to be sad. Because there are lower prizes that can also make you rich. For example, the second prize in a Powerball won for getting five white ball numbers is $ 1 million at a time. Pretty tempting isn't it? Even though playing a lottery like Powerball is a chance game, there are actually several strategies to increase your chances of winning. Here are the 3 tips and strategy that can help increase your chances of winning at the Powerball Lottery and become the powerball winners. Choose the Powerball strategy you want and increase your chances instantly! Make some research about the frequency chart for previous winning lottery numbers from the game you are going to play, it can be a powerball or mega million. In this case, we set an example for the online Powerball lotto. What you have to do first is go online and find the frequency chart or powerball payout chart that shows how often certain winning numbers have been taken. After you have finished researching the chart that showing which Powerball winning numbers are most taken, you can use this strategy to choose your own number that less taken by others. The risk of this strategy is that many other players use this tactic too. But to avoid the same number as other players, you can consider using a reverse strategy and choosing a number that is less often taken. That way, there will be fewer people who take those numbers. And if any of them also win this lottery, you have to share your winnings with other Powerball winners. I will give a simple example, the results of Powerball's research have shown that the top lottery winner number for white ball is 41 and then followed by 18, 25, 34 and 15. And the most drawn number of Powerball red balls is 19, followed by 34, 36 , 1 and 30. Data like this can be considered a double-edged knife, because you might think that the least drawn numbers are now most expected to appear, or you might want to play with the most "popular" numbers in the future. How to win the Powerball lottery is not a simple question to answer. Because to increase your chances, you need to take advantage of all the features and tips to increase the opportunities that give you benefit. Try to play Game Group. Playing Game Groups is one of the best strategies for winning Powerball or other lotteries. By playing Powerball in groups, you can collect money together with other people. Instead of hoping that one of your tickets reaches the jackpot, it would be better if you can have hundreds of opportunities in one draw, all at the price of a paired ticket! The only drawback of playing powerball in a group game is that you have to divide the jackpot prize. But that's not a big problem, if you want to know how it feels to win a Powerball with a large size jackpot, Group Games are the best choice to be able to win Powerball more easily. Total prizes from Powerball jackpots are worth hundreds of millions, which means that even with 1% of group games, you can still become a Powerball millionaire. Use these 3 tips and strategies wisely and increase your chances of becoming the next Lucky Powerball Lottery winner. Each of the tips that I share is a Powerball strategy that is likely only known to a few people, choose the strategy that you want to use well. If you have tips, tricks, or other strategies on how to win Powerball, you can share with us in the comments section below. 0 Response to "How to Play Powerball Correctly to Win Easily"